Throughout California, Local 1000 members are purpling up and standing shoulder-to-shoulder to show the state we’re committed to fight for a contract we can all be proud of. We’re telling the state their current contract offer does not value or respect the services we provide and we won’t stop until we win a contract we can all be proud of. Thousands of members are taking the pledge to participate in all Local 1000 authorized actions. Have you taken the pledge yet? Contact your steward or worksite organizer, call the Local 1000 Member Resource Center at 866-471-SEIU (7348) or click here. 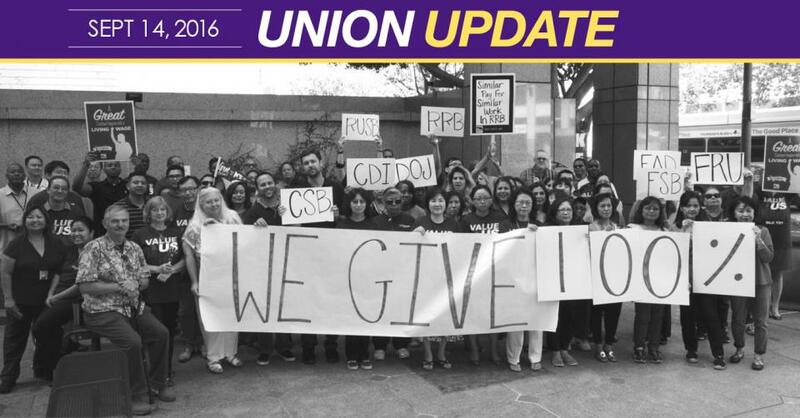 Keep up with the latest bargaining news and more from Local 1000—make sure your contact information is up to date. Our news is only sent to your home email address—no longer through state email systems. As we stand together to fight for a strong contract, our rights to take action in support of Local 1000 are protected by California state law and provisions in our union contract. If you are prevented from exercising your right to participate in any way, contact your Local 1000 job steward. You have the right to support our union and to express pro-union opinions to other employees and to management. You have the right to wear buttons and stickers and to wear union clothing. You have the right to post and display union materials inside your workspace. You have the right to distribute union materials during non-work time. Post our union materials You have the right to display union materials on appropriate bulletin boards. You have the right to attend union meetings on nonwork time.